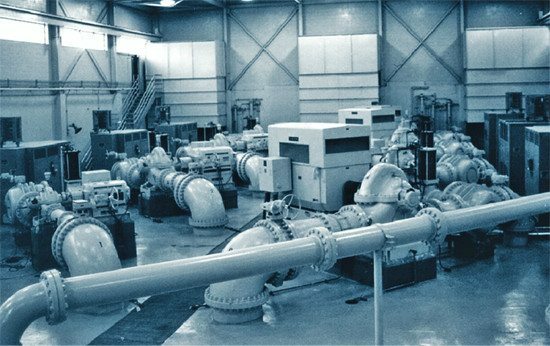 Pumping systems account for nearly 20% of the world’s energy used by electric motors and 25% to 50% of the total electrical energy usage in certain industrial facilities. Significant opportunities exist to reduce pumping system energy consumption through smart design, retrofitting, and operating practices. In particular, the many pumping applications with variable-duty requirements offer great potential for savings. The savings often go well beyond energy, and may include improved performance, improved reliability, and reduced life cycle costs. Most existing systems requiring flow control make use of bypass lines, throttling valves, or pump speed adjustments. The most efficient of these is pump speed control. When a pump’s speed is reduced, less energy is imparted to the fluid and less energy needs to be throttled or bypassed. Speed can be controlled in a number of ways, with the most popular type of variable speed drive (VSD) being the variable frequency drive (VFD). Pump speed adjustment is not appropriate for all pumping systems, however. 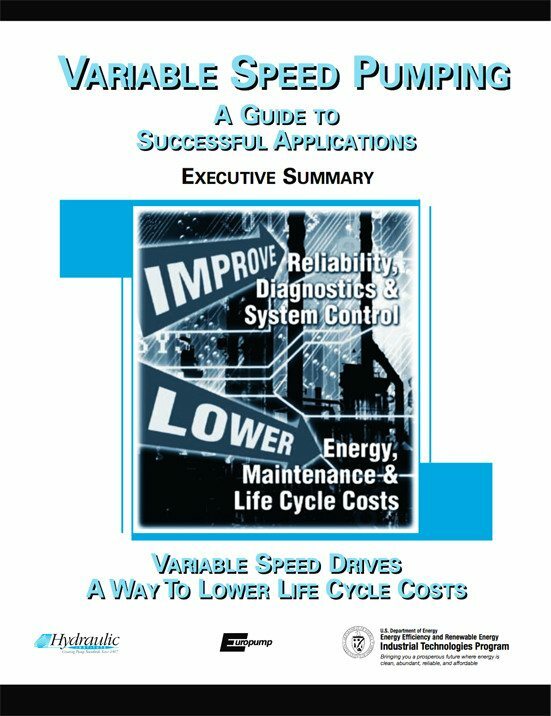 This overview provides highlights from Variable Speed Pumping — A Guide To Successful Applications, which has been developed by Europump and the Hydraulic Institute as a primer and tool to assist plant owners and designers as well as pump, motor, and drive manufacturers and distributors. 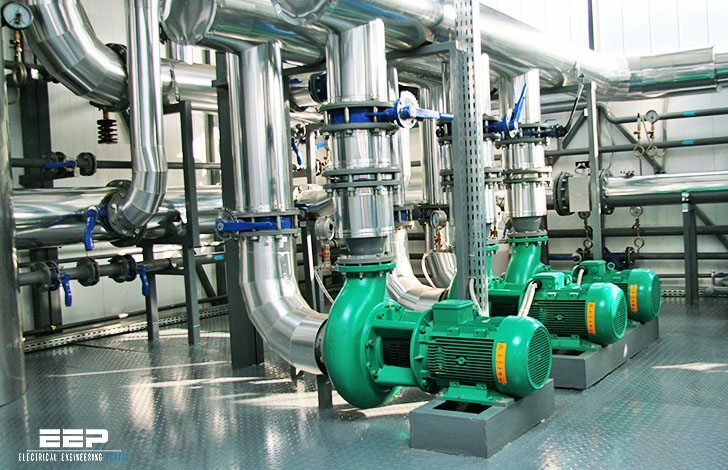 When the requirements of a pump and system are understood, the user can consult this guide to help determine whether variable speed pumping is the correct choice. The guide is applicable for both new and retrofit installations and contains flowcharts to assist in the selection process. A proper discussion of pumping considers not just the pump, but the entire pumping “system” and how the system components interact. The recommended systems approach to evaluation and analysis includes both the supply and demand sides of the system. In a pumping system, the objective, in most cases, is either to transfer a liquid from a source to a required destination, e.g., filling a high-level reservoir, or to circulate liquid around a system, e.g., as a means of heat transfer. Pressure is needed to make the liquid flow at the required rate and this must overcome losses in the system. Losses are of two types: static and friction head. Static head, in its most simple form, is the difference in height of the supply and destination of the liquid being moved, or the pressure in a vessel into which the pump is discharging, if it is independent of flow rate. Friction head (sometimes called dynamic head loss), is the friction loss on the liquid being moved, in pipes, valves, and other equipment in the system. This loss is proportional to the square of the flow rate. A closed-loop circulating system, without a surface open to atmospheric pressure, would exhibit only friction losses. Most systems have a combination of static and friction head. The ratio of static to friction head over the operating range influences the benefits achievable from VSDs. Static head is a characteristic of the specific installation. Reducing this head whenever possible generally reduces both the cost of the installation and the cost of pumping the liquid. Friction head losses must be minimized to reduce pumping cost, but after eliminating unnecessary pipe fittings and length, further reduction in friction head will require larger diameter pipes, which adds to installation cost. Actually i was really searching VFD application in refinery. My customer want to know how they will get benefits after replacing DOL / Y-Delta starter to VFDs. Thank you very much for sharing valuable information. Ur site is super super super fantastic for me. All professional info at one place. Will explore it indepth.